It has been said that being an Aggie doesn't just define where you went to school, it defines who you are. Many of Texas A&M's more than 436,000 former students are icons in their career and pillars of their community. And let's not forget about the distinctive Aggie Ring, an outward symbol designed more than 100 years ago, that identifies former students as Aggies and connects them to the Aggie Network. 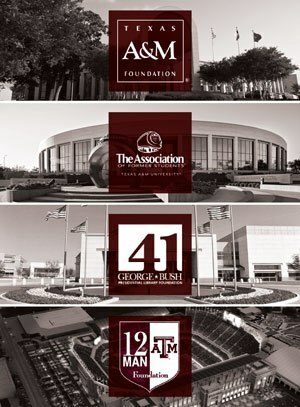 Through the Texas A&M Foundation, the 12th Man Foundation, The Association of Former Students, and the George Bush Presidential Library Foundation, former students provide tangible evidence of their deep-rooted loyalty to Texas A&M by contributing millions of dollars each year to support our university. 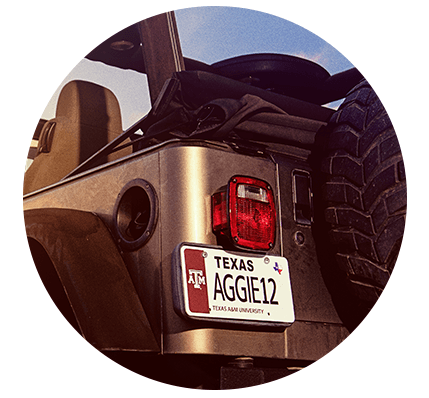 Order one of three official Texas A&M University Collegiate License Plates and show your Aggie Spirit wherever you go. Proceeds from your purchase help fund university scholarships.